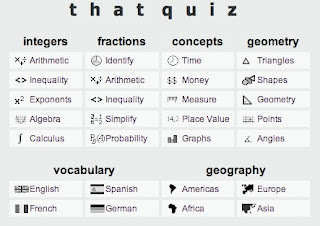 Here is another great resource to give a chance to your students to get a little bit more practice in math, language or geography: That Quiz! The tool is totally free to use. It includes a series of randomize quizzes in arithmetic, about fractions, probability, time, money, measure, place value, graphs and geometry. Most quizzes can be configured to increase or decrease the level of difficulty and students get immediate feedback. When it comes to languages, students can practice English, Spanish, French and German. The language quizzes include definitions, translations and verbs. In geography, the students can get quizzes for the Americas, Africa, Europe and Asia. The quizzes include countries, rivers and capitals all with an actual map of the continent. It is an excellent way for your students to get unlimited practice when studying. It is perfect for parents who want some "extra work" to do with their children. I hope you like this site. This site is very helpful for teachers. July 21, 2010 at 2:57 a.m.